Looking for a gift that will make your employee’s day? Want to stay cool in the shade at the next company picnic? JoeShade makes a great addition to any company outing and is a fantastic promotional giveaway. The versatility and dynamic range of JoeShade sun shade umbrella makes it perfect for any number of fun outdoor activities – not to mention it’s a big hit with just about everybody during the summer months. Many corporations and non-profits have already given away JoeShade sun shade umbrellas, and we love hearing the great feedback we get after a successful company outing. 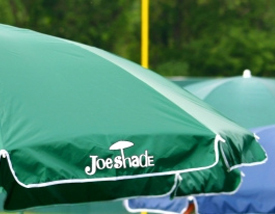 When we designed JoeShade, we made sure it had everything you could ever want in a sun shade umbrella. The canopy is 60” in diameter, providing an extensive amount of shade. Its sturdy base is supported by a tripod stand that gives it great support even if it’s standing on uneven ground. The adjustable stand lets you setup the perfect amount of shade no matter the surroundings, and its tilt functionality lets you receive protection from the sun from multiple angles. Wind vents allow you to adjust your setup whenever wind gusts start to pick up, while the broad base and optional stakes ensure you and your employees will never have to worry about it blowing away. JoeShade sun shade umbrella also comes in three colors: blue, green and red. Whether they use it during a relaxing getaway at the beach or on a sunny outdoor retreat, your employees will appreciate their ticket to fun in the shade without a care in the world. JoeShade also makes a great addition to any company outing, letting your employees enjoy all the benefits of an outdoor getaway without having to worry about sunburn or harmful UV rays. And best of all, JoeShade’s lightweight, portable nature means you’ll be able to take it just about anywhere. Just fold it up and store it away in the compact, matching carry bag and you’ll be on your way. Get a JoeShade today and make sure your next company outing a memorable one. And don’t forget, you can put your corporate logo on JoeShade and get people talking about your brand!